The PCP 5029 Heavy Duty Extra-Wide Commode is for someone who is bed confined or can't get from the bed to the bathroom easily. It is 7 inches (17.8 cm) wider than standard, and safely supports someone weighing up to 450 lbs. Seat height adjustment: 19-22 inches; (48-56 cm). Overall width 28 inches (71 cm); overall depth 21 inches (53 cm). Width between arms 24 inches (61 cm). 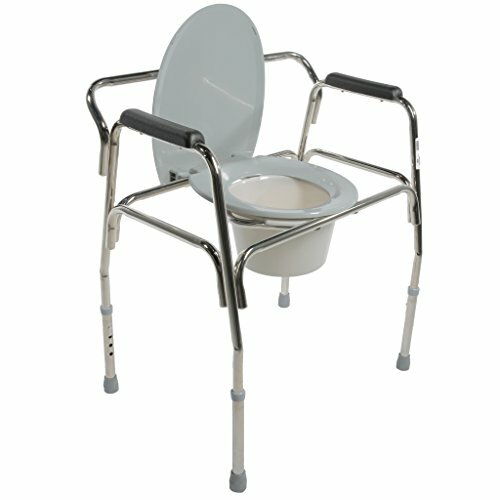 Strong welded steel frame, 7 inches (17.8 cm) wider than standard commodes. Molded plastic armrests for added comfort. Lightweight clip on seat and lid is easily removable for cleaning. Includes removable 6 qt. commode pail with lid.